The 23rd Golden Age Award honorees joined by Adriene Rosell, Gala Chairman and Mario Tapia, LCA President: Aida Rosario from Univision-41 NY; Allan Wernick from CUNY's Citizenship Now! ; Paul Meyeroff of ProCare; Dr. Arnold Saperstein from MetroPlus; and Dr. Mark González from Aspira-NY. (Photo courtesy of Christopher Rybin). NEW YORK, NY -- The Twenty-Third Golden Age Awards Presentation was successfully held this June 25th, 2015 at Villa Barone Manor, Bronx, NY. LCA'S CALENDAR OF EVENTS IN SOUTH FLORIDA FOR 2019. April 20 - 9:45 am "Para Mayores" on La Poderosa 670 AM Radio. April 25 - 9:00 am - 2:00 pm - Latinos and Alzheimer's Conference - Miami Lakes. For Vendor/Sponsorship Opportunities Click here! April 27 - 9:45 am "Para Mayores" on La Poderosa 670 AM Radio. May 4 - 9:45 am "Para Mayores" on La Poderosa 670 AM Radio. May 7 - SF Advisory Board Meeting. September 21 - 6:30 pm - 10:00 pm - 2019 Golden Age Awards Gala - Pullman Miami Airport. Dr. Elaine Acosta from FIU, the Conference Guest Speaker joined by Mario Tapia, LCA's president during "Para Mayores," LCA's Weekly Radio Show at La Poderosa 670 AM (Photography by LCA). MIAMI, FLORIDA - April 12, 2019 - The Latino Center on Aging (LCA) and its South Florida Advisory Board in conjunction with the Town of Miami Lakes, its Elderly Affairs Committee, the South Florida Hispanic Coalition for Aging, and the Alzheimer's Association - Southeast Chapter, will hold its seventh LCA Conference in South Florida geared to the Latino elderly and their families, "A Life Without Memory: Latinos and Alzheimer's." The conference will take place during the morning and part of the afternoon on April 25th at the Roberto Alonso Community Center, Miami Lakes, FL. The conference will be conducted by Mario Tapia, President and CEO of the Latino Center on Aging. The Guest Speaker will be Dr. Elaine Acosta from FIU. In addition, there will be a Panel of experts, which will include Hon. Luis Collazo, Miami Lakes Councilman; Dr. Annelly Buré and Dr. Marina Sarno from the University of Miami; and Jesica Lozada from the Alzheimer's Association. According to the Alzheimer's Association, nearly 200,000 Latinos living in the U.S. are suffering from Alzheimer's, number that in 2050 will reach 1 million 300 thousand (the total population of patients with Alzheimer will grow from five million today to 16 million in 2050). "Presently, in South Florida live 500,000 people over 60 years of Hispanic origin, that number will rise to over one million in the next 30 years, this being a powerful reason to do our best to educate our community about this, and other devastating diseases," said Mario Tapia, president and CEO of LCA. Conference Sponsors: AARP Florida - Advocate Health - Alzheimer's Association - Brain Center - Chen Senior Medical Center - Douglas Gardens CMHC of Miami Beach - Elite Health Medical Center - Humana - Insurance Consultants International - Leon Medical Centers - PACE and Douglas Gardens Home Care - Sunshine Health - Sunshine Life Health Advisors - United HealthCare - United HomeCare - WellMed. The outstanding professionals that received the 2018 Golden Age Award. From left: Dr. Catherine Funes, Gus and Lilliam Machado, María Hidalgo (accepted on behalf of Jorge Rodríguez), Ana Teri Busse-Arvesu, Mario Tapia (LCA President and CEO), Liliam López, Carlos Martínez, Adriana Cora, and Giovanna Drpic, Gala MC (Photography by Baggio Correale). MIAMI, FLORIDA - October 14, 2018 - LCA's 2018 Golden Age Awards Gala was a total success. It was held at the Pullman Airport Hotel, Miami on Saturday, October 6th. The Golden Age Award has been given since 1993. The 2018's South Florida Golden Age Award recipients were: Liliam López, Adriana Cora, Gus and Lilliam Machado, Jorge Rodríguez, Ana Teri Busse-Arvesu, Carlos Martínez, Luis De Rosa and Victoria Samuelson. The Hon. Josefina Carbonell from ILS and María Hidalgo from VITAS Healthcare were the event's Co-Chairs. The Mistress of Ceremony was Giovanna Drpic from CBS46 News in Atlanta. This eventful gathering has taken place in highly prestigious landmarks of the City of New York: The Lincoln Center (1993), The United Nations (1994, 1995 and 1996), and until the year 2001 at The World Trade Center (107th Floor). Since 2003 it is being held at the Inter-Continental, The Barclay, 111 East 48th street, NYC. The 2018 Golden Age Awards Annual Gala was sponsored by Independent Living Systems - United Home Care - VITAS Healthcare - Chen Senior Medical Centers, Hialeah Hospital and Liga Contra el Cancer. The Mission of the Latino Center on Aging (LCA) is to enhance the living conditions of the Latino elderly through community education and advocacy. The role of LCA's South Florida Advisory Board is to offer guide and support to LCA in this area. Some of the participants of the South Florida Coalition for Aging meeting this past August 18th at ILS. The Guest Speaker was Josefina Carbonell, former Assistant Secretary for Aging at the Administration on Aging within the U.S. Department of Health and Human Services. LCA's creation of this coalition is in addition to its radio segment in La Nueva (The New) FM 88.3, three conferences on Alzheimer's and the formation of an Advisory Board, composed of brilliant professionals in the field of gerontology from the Broward and Miami-Dade County area. The graph shows the statistical projection of the population of people over 60 years of Hispanic origin residing in Broward and Miami-Dade. 200 thousand in 2010 is projected to one million in the next 35 years. The present number is close to 300,000. Services and programs for this segment of the population does not go according to its rapid and unprecedented growth. These initiatives are of particular importance due to the increasing population of Hispanic elderly people living in this region and their future projection. This projection represents a big challenge. According to the U.S. Census Bureau, presently there are over 300 thousand Hispanics 60 plus residing in South Florida, number that will reach one million in the next 35 years. The need for information about existing programs and services proves to be more than obvious, besides of being crucial. The LCA is bringing its years of experience and knowledge to the population of older Latinos, with respect for their culture and language. The determination of the Latino Center on Aging and its South Florida Advisory Board is to bring to the whole community of elderly Hispanics relevant and timely information on topics of interest through educational conferences and media utilization. Our work has just begun and our decision is already being executed. Together we can and should improve things. 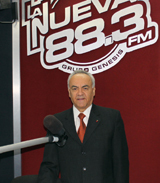 PEMBROKE PINES, FL -- June 28, 2018 -- With great success LCA has continued a radio segment on Radio La Nueva 88.3 FM in South Florida and in the New York Metro area on 93.1 FM. Conducted by Mario Tapia, LCA's President & CEO, brings information on topics of interest to the growing Spanish speaking elderly. The segment goes on air the fourth Wednesday of every month at 9:45 AM. In 2014, the state of Florida will be the most populous state in the entire Atlantic coast and third in the U.S.
MIAMI - January 2, 2014 - On Monday, the U.S. Census Bureau published its latest population estimates. From April 2010 to July 2012, Florida's population grew by 2.7%. Thus, this year Florida will become the third state in the U.S. population, ahead of New York, due to immigration, mainly Latino immigrants. When this happens, the three most populous states are also the three with the highest concentration of Hispanic population: California, Texas and Florida. If Florida beats New York in population, probably end up with more seats in the U.S. House of Representatives. In 2010, after the publication of the new census data, New York lost two seats and Florida won two. Both states now have 27 members in the House. Our new homepage has been underwritten by the generous support of our friends at Glades West Rehabilitation Center and Residential Plaza.